You probably don’t think about it much, but your property is filled with pipes bringing water into and out of the building. Whether it’s the sink you wash your hands in or the washing machine that cleans your clothes, you need a constant flow of water to keep your home running smoothly. But so much water also means a decent chance of indoor flooding. Indoor flooding is one of the leading causes of water damage, and can require basic plumbing repairs and water damage restoration services to repair. Thankfully, the Pro Restoration offers reliable and effective water and flood damage restoration services as well as plumbing repair services that will make your home dry, repair your property, and make sure you don’t have another flood. To help you combat floods when they strike, we’re running through the most common causes of indoor flooding. A broken pipe can flood your home in a matter of minutes, filling your property with water that will require water damage repairs and even carpet cleaning services depending on where the burst occurs. Meanwhile, leaky pipes are a warning sign of problems to come, and will require a plumber to properly fix. Hidden floods caused by broken pipes in your walls can even create the perfect environment for mold, requiring the likes of Pro Restoration’s mold remediation services to combat. A standard water heater is designed to constantly fill itself, providing you with warm water for when you’re taking a shower or washing dishes. But if you have a leak in your water heater, this can cause a major disaster. Even a small leak in your water heater can cause major flooding due to its endless flow of water. Make sure to inspect your water heater on a regular basis, keeping up with its maintenance to insure it doesn’t spring a leak. You need water to flow to and from your house with ease. And that flow can be completely disrupted when you have clogged sewer or drain lines. Some clogs might seem benign, allowing for a slow drain that’s merely an inconvenience. But those clogs can get worse, potentially causing your sinks, toilets, and showers to overflow with water, resulting in big floods that cause big damage. If you notice minor clogging, be sure to contact a plumbing service to make sure your problem doesn’t get worse. Washing machines bring plenty of convenience into the home, freeing up your schedule by cleaning clothes with ease. But like any appliance that uses water, a malfunctioning washing machine can cause indoor flooding. The most common problem with washing machines are faulty washing machine hoses. A leak in your intake hose — the hose that brings water to the machine — can worsen over time and can cause flooding in your home. You can take steps to make your machine safe, like installing a washing machine valve shutoff kit, but there’s always a chance your washing machine will flood. You can’t control when a flood hits your home or business. Thankfully, if you can recognize the common causes of indoor flooding, you’ll be prepared to prevent floods before they happen and handle them when they strike. 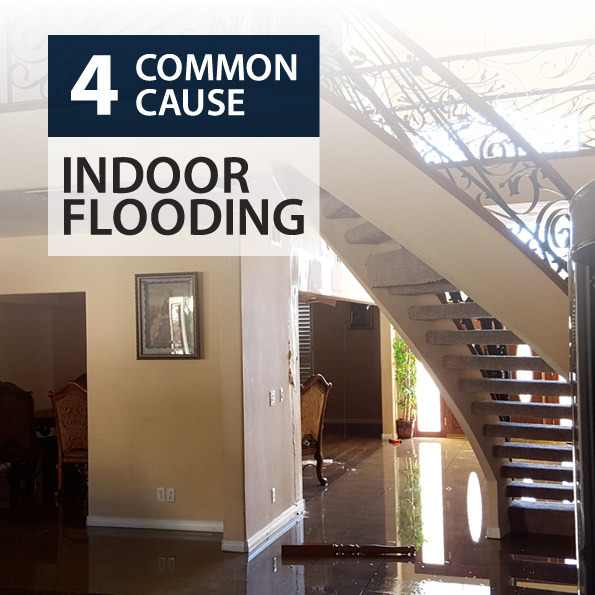 If you’re in need of water damage or flood damage restoration services in Las Vegas, Henderson, or anywhere in Clark County, consider Pro Restoration. Our technicians use state-of-the-art techniques to remove water from your property and repair water damages, even offering 24/7 emergency services. Contact Pro Restoration today for more information on our residential and commercial property restoration services.